Rewards Canada is known for their reviews of Travel Rewards Credit Cards but now we take the foray into reviewing a non-Travel Rewards card with our first ever review of Cash Back Credit Card. Cash Back has been making big inroads in the reward credit card scene and taking a bite out of the strangle hold that Travel Rewards has had in the market. While Travel Rewards are still the most common type of credit card and most held by Canadians, Cash Back is growing by leaps and bounds. The SimplyCash™ Preferred Card from American Express® hit the market on September 2nd, 2014 and marks American Express' first foray in the Cash Back market with a credit card product rather than a charge card product. Prior to the launch of the SimplyCash and SimplyCash Preferred cards, American Express briefly brought back their Gold Cash Rewards card but it didn't fair too well so it was once again pulled from accepting new applications but those who have that card get to keep it. American Express wanted to make sure that their new Cash Back cards were not only strong in their rewards and benefits offering but easier to use than many of the other cash back cards out there. They did this by offering a higher across the board cash back rate than many competing cards and doing away with the confusing tier bonuses and category bonuses seen on other cards. Unlike Travel Rewards Cards, most Cash Back cards do not have a a sign up or welco bonus but some do have incentives for using the card right when you get. The SimplyCash™ Preferred Card from American Express® comes with this type of incentive program which awards 5% cash back on all purchases in the first 6 months up to a maximum of $400 cash back. Its no-free brethren, the SimplyCash Card from American Express offers 5% cash back on all Gas, Grocery and Restaurant purchases in the first 6 months up to a maximum of $250 cash back. The SimplyCash™ Preferred Card from American Express® comes with a $79 Annual fee which matches some other cards with similar rewards and benefits. At the $79 level, this card is about the middle of the pack for all the Cash Back cards that do have an annual fee. The interest rate on the card is 19.75% which is slightly lower than the 19.99% see on the majority of Cash Back cards. After you exhaust the first 6 month incentive bonus, The SimplyCash™ Preferred Card from American Express® has nice simple earning structure: 1.5% cash back on all eligible purchases up to $100,000 in spend per year. After $100,000 that drops down to 1.25%. The No-Fee version earns a straight 1.25% on all purchases after the first 6 month incentive bonus. The beauty of Cash Back credit cards is the simplicity in redemption. There are only two ways to redeem your cash back and both tend to be automatic. Either a cheque is issued to on a monthly, quarterly or yearly basis or it is issued as a statement credit on a similar time basis. For the SimplyCash™ Preferred Card from American Express® it is the latter as the cash back reward is issued as a annual statement credit. This is where Cash Back tends to be a little less rewarding than Travel Rewards as most Travel Rewards cards, especially those that don't have set redemption charts, give you access to your rewards that you have earned on a monthly basis rather than a yearly basis. But then again you are limited to travel whereas with this cash back you can use it on anything you want as long as that place accepts American Express! The SimplyCash™ Preferred Card from American Express® comes with a very strong suite of insurance and benefits that are normally seen on Travel Rewards cards. These include Flight Delay, Baggage Stolen/Lost, and Car Rental insurance but also includes out of province medical insurance for 15 days for those aged up to 65. That last benefit is seen on less than a half dozen cash back cards in Canada! The card also features your standard purchase protection and extended warranty insurance. As the name infers, The SimplyCash™ Preferred Card from American Express® comes with simplicity and that is one good thing about the card. You don't have to get confused with all different cash back rates for different levels of spending (just see the CIBC Dividend Visa Infinite for a great example of this confusion) just a simple 1.5% back up to $100,000 and then 1.25% thereafter. Most people will just get the 1.5% back we imagine! The benefits that the card affords are not only good but should be titled 'great'. It has the majority of benefits seen on a Travel Rewards Credit Card including out of province medical insurance! The only major insurance benefits missing are Trip Cancellation and Trip Interruption. The SimplyCash™ Preferred Card from American Express® comes with some small drawbacks, not enough we believe to warrant knocking this card out of your selection process. The first, as is always the case with American Express, is the issue of acceptance. True, Amex is not as widely accepted as Visa or MasterCard but that tends to be from a lot of the smaller mom and pop type merchants. As well Amex is adding new merchants everyday and you can even call them up to see if they can approach one that you shop at to see if they can start accepting American Express. The second not so good thing about the card is the annual fee. True there are quite a few higher end cash back cards with similar benefits that have the same or higher annual fee but there are some that offer a good proportion of those benefits with no annual fee. Granted you can always go for the SimplyCash Card (not the Preferred version) if you want to avoid annual fees. Finally the third gripe we have is the annual statement credit. We get it. American Express wants you to spend that money with their merchants as they'll make money off the merchant fees but perhaps they should at least look at increasing the amount of times it is awarded (not just once per year) when you have to compete with mbna who will issue you a cheque every month if your cash back rewards total $50 or more. Being our first review of a Cash Back card here on Rewards Canada it is tough to give the SimplyCash™ Preferred Card from American Express® a good or bad conclusion. On the whole the card seems very strong. With a 1.5% return it is encroaching the realm of the better returns seen on higher end Travel Rewards cards but still falls short a couple of tenths of a percent. That being said it does seem like a very decent return when compared to other cash back cards. True those others may have higher returns in select categories but when you average out all your spending there is a good chance you'll get a better return with this card. The card itself can make an excellent primary or first card in your credit card portfolio if you aren't into travel rewards but for those who are travel savvy and can't get away from the almighty mile or point then this or the no-fee version of the SimplyCash card could make a good secondary or tertiary card in your wallet. Care to comment? Do you agree or disagree with us? 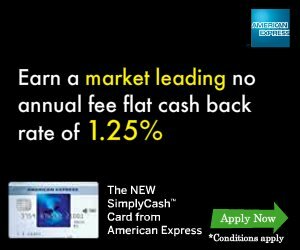 Tell us what think about the SimplyCash™ Preferred Card from American Express® below!